A couple weeks ago we had a guest on the Sibe Vibe. Her name is Cameo Anderson and she is a digital illustrator and artist. I commissioned her to do a painting for us. It is going to be a fundraiser for our team and we will offer sign and numbered prints. In the painting is Ineka in single lead wearing his silver harness. 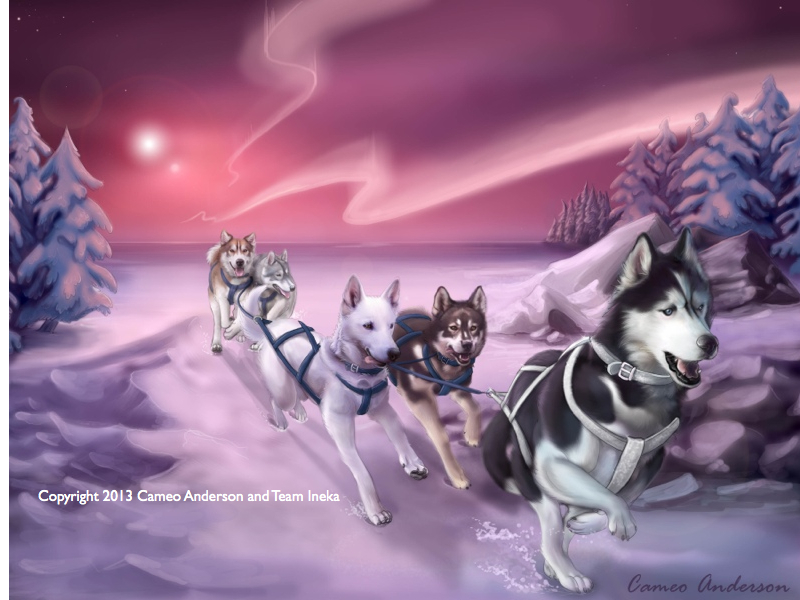 If you are a musher you know that all sled dogs go to heaven and run with their team in a silver harness for eternity. Behind Ineka is Sidney and Ragnar and they are followed by Bodhi and Raegan. The attention to detail is amazing! Cameo is a wonderful artist and captures the personality of the dogs perfectly. It is almost lifelike. As you can see by the painting the team is running on the tree-lined frozen tundra with the northern lights overhead. Check out Cameo Anderson’s Facebook page. Listen to the Sibe Vibe episode featuring Cameo Anderson. Please respect the rights of the photo and the artist and do not copy without permission. What do you think of Cameo’s work?